The Paphos region of Cyprus is enormous and covers the practically the entire western side of Cyprus. It gives its name to both the international airport which serves the area and one of the most popular holiday resorts on the island. Whichever town you happen to be in at the time you can, within just a few kilometres, be on an endless stretch of golden sand. Or amongst rolling hills with miles of countryside stretching out before you. Such is the diversity of the landscape here. It is hard to put into words just how scenic Cyprus is. For the first time traveller especially trying to picture an island of such beauty is particularly difficult. In this area alone you will have the chance to visit monasteries, gaze at ancient mosaics, wander around nature reserves and stroll through pine forests. Add to this wineries and vineyards, mountain villages and numerous golf courses and you will start to get the idea of why this is such as popular destination. Apart from Paphos there are several other notable resorts in the area with Polis being the one most people know by name. There is much to do and see if you decide that a stay in either of these towns is the next one to tick off your must visit here. But be warned, you may find you want to keep returning time and time again. 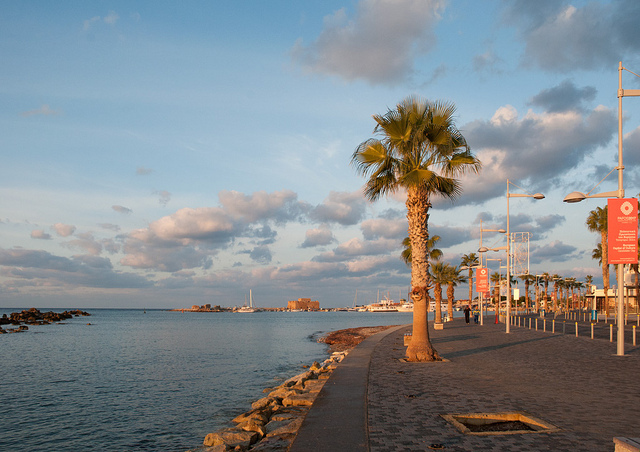 Here is an overview of what visitors to Paphos can expect from their trip here. Geographically, Paphos started life as two separate areas before expanding over time to have one large town we have today. Between the two; Kato (lower) and Pano or Ktima (higher) Paphos there were so many archaeological and historical sites, So much so that UNESCO had somewhat of a dilemma. They solved it by, instead of them all being listed separately, they designated the entire town as a World Heritage Site. Upon visiting Paphos, however, you will soon see that Kato and Ktima are very different areas characteristically. They both boast their own cultural and historical sites. Kato Paphos is very much the main tourist area with the beach and the harbour whilst Ktima is the commercial, retail and residential part of the town. Kato Paphos was, under Roman rule, the capital of Cyprus. It was only during the decline of the empire that Nicosia in the north became the capital, and remains so to this day. Kato Paphos is known locally as the “Western Cyprus Riviera” and it is along this coastal strip you will find most of the hotels, bars, restaurants, clubs etc. Unlike many other resorts on the Med you will find many Cypriot families enjoying their holidays here, and there is no better recommendation than that. There is a lively night life here but the those bars and clubs with the late licences are all together in “Bar Street”. This makes them very easy to find, or very easy to avoid, depending on your point of view, point of view or type of group you are holidaying in. There is a wealth of bars and tavernas geared towards families so you can enjoy a holiday here without ever encountering the side of the town which only comes to life once the sun sets. Anyone looking to come to Paphos has a vast choice of accommodation options, with something for all budgets. Try icelolly.com for some good deals or you can get a flight directly and then camp or enjoy the hostels and camping grounds littering the island. has them all in place to peruse at their leisure. Whether you want a quite apartment with a pool, a lively hotel frequented by other clubbers or a luxurious all inclusive hotel you will find it here. For those who don’t want to just lie on the beach all day recovering from the night before in preparation for the night ahead, there are many things to enjoy in the town. These include the mosaics, The Medieval Fort, The Tombs of The Kings, glass bottom boat trips, watersports, the aquarium and the Aphrodite Waterpark. Paphos is one of those resorts that really does have something for everyone. Whatever age you are and whatever holiday you enjoy you will find it here. Throw in the magnificent cuisine and legendary hospitality and it is easy to see why Paphos is one of the stand out holiday destinations in Europe.